China and Australia are major agricultural producers. The economic and trade relations between the two countries are close and active. Although there are different legal and cultural traditions between China and Australia, both countries face similar legal issues concerning agricultural development and production. Since the foundation of the People’s Republic of China, China has gradually set up an agricultural legal system. The system includes rules for systems of agriculture and the rural economy, the management of agricultural production, agricultural resource and environmental protection, agricultural industry development, agricultural support and protection, agricultural worker safety and quality and safety of agricultural products. China actively participates in relevant international treaties and law enforcement. With economic and social development, the rural legal system has required constant refinement and innovation, helping to promote the development of agricultural industries and maintaining a fair market environment, to protect the interests of farmers. 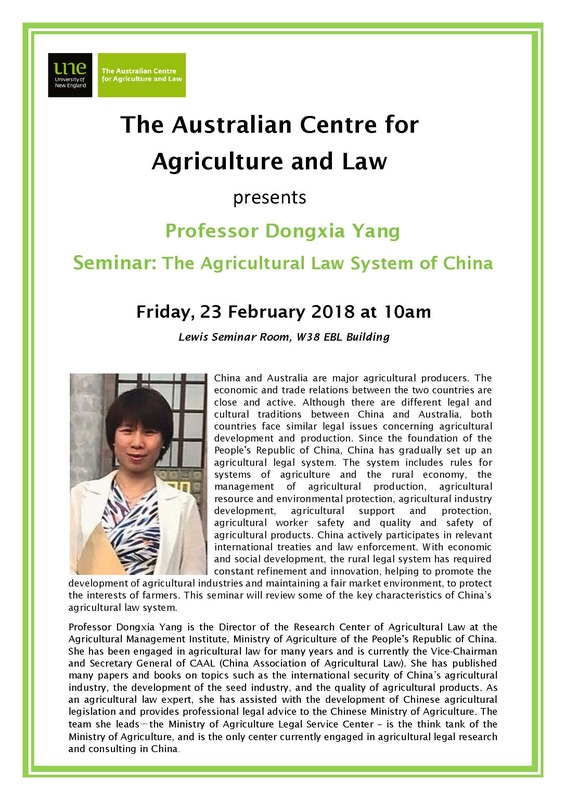 This seminar will review some of the key characteristics of China’s agricultural law system. Professor Dongxia Yang is the Director of the Research Center of Agricultural Law at the Agricultural Management Institute, Ministry of Agriculture of the People’s Republic of China. She has been engaged in agricultural law for many years and is currently the Vice-Chairman and Secretary General of CAAL (China Association of Agricultural Law). She has published many papers and books on topics such as the international security of China’s agricultural industry, the development of the seed industry, and the quality of agricultural products. As an agricultural law expert, she has assisted with the development of Chinese agricultural legislation and provides professional legal advice to the Chinese Ministry of Agriculture. The team she leads－the Ministry of Agriculture Legal Service Center – is the think tank of the Ministry of Agriculture, and is the only center currently engaged in agricultural legal research and consulting in China. Morning tea will be provided at the beginning of the seminar – for catering purposes, please rsvp by Thursday 22 February (3pm) to Anna Lawlor.